Maybe Gary Johnson for a Change? "Change" has gotten a bad reputation lately as a large number of citizens have awakened from their fantasy world sleep, come to their senses and have thus realized that nothing has really changed in the way things are being operated by the agents of the now infamous "Hope and Change" mantra. Change? Government is not more transparent, things are not more fair, attitudes among different racial groups have not suddenly improved because a multi-racial man was elected President, politicians still do what they want to do instead of what the people want them to do, and the recession (depression?) has not ended. It's a partial list for sure. And the few things that have changed, have changed for the worse, not the better. The latter list is at least as long as the former. Real change, not just a change of which clowns are running the circus, is what those newly awakened people are thinking about. I have been preaching (ad nausem) about having a fundamental change in the debate in this country for so long it makes my friends and relatives weary. But instead of blaming Barak Obama and the leftist oligarchy currently in power for lurching the country towards socialism, I would opine that they deserve our gratitude. (in a perverse sort of way) They have adjusted the contrast control on the national TV set in ways they never intended. The contrast between the traditional values of earlier Americans vs the way we are actually living has become stark enough to change that debate to the only one which really matters in determining the outcome for the American experiment in republican governance. Although a media stuck in a Utopian fairy tale re-run never mentions it (or gets it), that debate has become more clear. Namely, as Dr. Walter Williams puts the question in framing that debate, "What is the proper role of government in a free society?" Oh, many in the political sciences, academia and a few other largely irrelevant groups have debated it one way or the other for generations, but only now has it become the great debate of the people. Tea Partiers, although not a formal or organized group, set the debate in motion by embracing the only core notions that bind them together. You can be sure that people counted among that group disagree on a whole range of issues. But the notions they have rallied around are; a smaller government that taxes less and is more fiscally responsible, and a less intrusive government that leaves people alone more often to solve their own problems in a free market. They agree that government should not be the agent to pick winners and losers or subsidize supporters while punishing objectors. Naturally, some other groups oppose their ideas, but now they are being forced to address them even as some among them are trying to avoid it by attempting to demonize those they oppose as racists and ignorant rubes. This time it's not working, so now the actual debate has begun. Which brings us to the question; Who is Gary Johnson and why does it matter who he is? It matters because he is different in many ways, and in his philosophy, he is definitely different than the type of politicians being held up as future leaders by the establishment types of both of the two (so far) relevant parties. Even though he works within the framework of the Republican Party, he isn't a favorite, or even on the radar screen of those who control that party. He probably scares them to death because they are kindred spirits with liberals in as much as they also believe that government exists to solve societal problems. They merely differ in their approach and selection of the "problems." Does anyone really think that Mitt, Sarah, Newt, Hillary, Barak or any of those old party types will actually shrink government's role in our lives if they lead the next government? I don't. They may rearrange the Legos, but the toy Tower of Pisa will still eventually topple over and our lives will need to be picked from the rubble. I am not suggesting Gary Johnson is the answer, time will tell. But I do know the question. Do "we the people" want actual change or just the continued decline into ever larger government controlled chaos? One of the greatest thinkers and writers of the 20th century, C S Lewis, once wrote; "We all want progress, but if you're on the wrong road, progress means doing an about-turn and walking back to the right road; in that case, the man who turns back soonest is the most progressive." Someone like Gary Johnson, someone from outside the establishment, might be the greatest "progressive" in that context, and must come to the fore, or we shall miss what might very well be our last chance to live our lives as we see fit, not in some Orwellian nightmare of what Thomas Sowell calls the Vision of the Anointed. Hey, don't blame me, it's not my concept. It's an Obamism. And he's not alone in espousing that point of view either. It's all very confusing, to me anyway. I mean, on the face of it, it seems that he and those of like mind are saying that "Health care is a right" for everyone, which of course includes the poor. But when you try to find quotes where he says that, you can only find him saying that "in a country as rich as this (USA) health care should be a basic right." For Americans at least. So I'm confused because that leaves out the people in countries which are not as rich as this one. Presumably, people in the poor countries of the world do not have such rights. (For a list of such countries just look for any which have little or no economic freedom) It seems those people are out of luck, and not just on that particular "right". Which leads to the logical conclusion that "rights" are a consequence of wealth. Or more correctly, of the wealth of those from whom you have the ability to confiscate it from in order to provide the "rights". Also presumably, the richer your neighbors are, the more rights you have. Maybe the right to a BMW or other luxury automobile. See, I told you it was confusing! But out of the confusion comes clarity. Simply move to a neighborhood where the people are rich, take a seat, and wait for your car and boat to be delivered. You have the "right" to do so. Come to think of it, maybe it's not so confusing to some people, like a lot of the illegal aliens who have been arriving here despite the efforts of the racist Arizonans. They are moving to a rich country so they can have the right to health care. Who knows, there may be a BMW in their future too! No confusion there. Believe it or not, this commentary is not about immigration. It's about the moronic notion that anyone in any country has a "right" to anything that must be taken from another person against their will. Next time you see one of those signs being held by a university graduate proclaiming that such rights exist, give some thought to the value of the education that was received by the sign holder. A degree in gullibility isn't just given away, it has to be earned. On June 15th, 2011 the following video was added to this well read post. 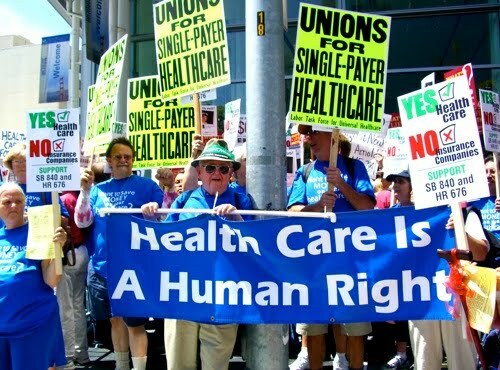 It is a wonderful explanation of rights in general as well as the "right" to healthcare. Blogging about Blog-o is probably a pretty popular activity today in light of the not-so-amazing non-verdicts in the Illinois corruption trial of the disgraced buffoon and impeached future convict/prison wife. In prison that hairstyle is sure to make him a popular date for some love-struck felon unless he can trade something to the warden to be assigned as cellmate for George Ryan. Ole George is too old to have switched sexual preferences just because he is incarcerated for similar offenses. The whole stupid affair has ended (for the meantime) in only one conviction out of a possible twenty four, and that one was for the same goofy and probably unconstitutional "crime" of lying to the liars at the FBI. And if he doesn't go to prison for his lying, then what was the whole Martha Stewart thing all about? If he goes, it should be for the things he did which were actually wrong, not just statutorily wrong. So just when you thought that the federal government might actually do one thing right in a thousand, they show how terribly incompetent they are by failing to convict the most guilty person since O J Simpson skated on the charge of cutting his ex-wife's head off and filleting her delivery boy in one masterful demonstration of night time knifesmanship. These are the folks who now are gearing up to make your health care decisions. His non-acquittal semi-escape seems to have validated his judgement that there is at least one dimwit on most juries who can be convinced by dog and pony shows and inane posturing to hang a jury, instead of the guilty. And it took Blog-o just a few moments to start the jury tampering for the re-trial down in the lobby of the courthouse, this time appealing to the long suffering inner city parents who's children are being murdered faster than the gang thugs doing the firing. It's hard to imagine anyone being shocked by this kind of outcome in Chicago, where the fix is always in and many if not most people think it's business as usual to sell anything you can to the influence buyers even if it's not yours to sell. Everyone needs a vacation now and then, even unpaid Internet bloviators. Which is why this blog hasn't been active for a few weeks. And it was historically fitting that the spot for our getaway happened to be in St. Germain Wisconsin, and the time of it was 440 years (almost to the day) after Charles IX of France signed the Treaty of St. Germain, ending the third war of religion and giving religious freedom to the Huguenots. Leaving aside that the place has no relationship to the event, it gives me a semi-great segue to the point of this commentary. In St. Germain this year the mosquitoes were sucking almost as much blood from the citizenry as our government is about to drain from them. Almost, but not quite. We got chewed up pretty well, and the rest of you are about to feel our pain when your wallets start itching in the near future. The so called "Bush Tax Cuts" are set to expire soon and I think many people (if not most) will be shocked to find out that apparently Obama was channeling George H W Bush with his own version of "read my lips" when he said no one who wasn't rich would pay even one penny more in taxes. My tax preparer says differently. As for me, I long ago reached the cynical saturation point, so no raised eyebrows on my aged face. About three weeks ago I got a letter from that well read tax preparer which laid out the increases in detail. It's frightening stuff for those struggling to hang on through this government induced mini-depression. It may even be enough to push us over the edge into a maxi-depression if nothing gets changed soon. 1. If you are in the lowest tax bracket (10%) your taxes are going up 50%. That's right, all you "non rich" folks, you are going into the 15% bracket on Jan. 1, 2011. There will be no more 10% bracket. So much for the "not one cent more for folks under $250,000" promise of hope and change. 2.The 25% bracket will rise to 28%. 3. The 28% bracket will be 31% and the top brackets for the evil rich people are going way up too. 33% = 36%, 35% = 39.6%. 6. Tax on dividends will rise 164%. For everyone. 7. Child tax credit drops 50% to $500 from $1000. For everyone. And none of this addresses the new taxes on the way for Obamacare, they are massive and start in 2013. So the new bloodsucking will start in a very few months, with one election just before the itching starts. 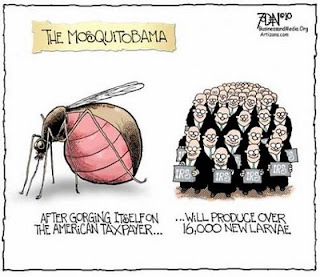 But I can already hear the buzzing. 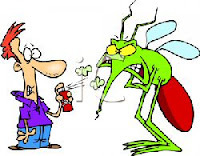 It may be time for some bug spray, complete with political Deet.